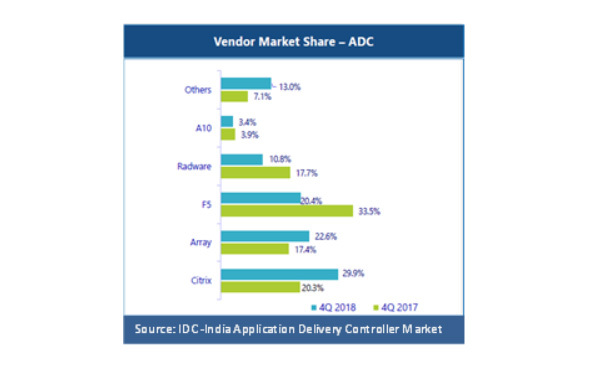 Array Networks Inc. announced that it has secured second position in the application delivery controller (ADC) market in India for Q42018. Compared to 4Q2017*, Array’s market share in ADC category has grown to 22.6% from 17.4% as per IDC’s Quarterly Ethernet Switch tracker, Q42018. The significant growth predominantly comes from its latest wins and closing deals in the government and large enterprise sector. Array Networks is a well-known brand in the market when it comes to combining the best attributes of dedicated hardware, virtualization and software-centric computing to create an environment that provides guaranteed performance for virtual networking and security functions.